Our guide for this adventure was also a little more rough and ready than we were used to. This was not Paris or A Boy named Sue. Actually we don’t know who it was, as his English was such that we never quite understood what his name was. He did manage to get across that we were his first tourists for two and a half months, but strangely enough he didn’t seem to be aware of why this was. He never mentioned politics or the generals and we felt that none of this had any relevance to his life. All he knew was that there were no tourists. The first afternoon he took us to Wan Pao Village , home of the Paloung Tribe. This village is the only village we see that is accessible by car, albeit over an hours drive along a mud path. The village is a cluster of ramshackle huts randomly scattered over a muddy field. The tribe is known for two things. 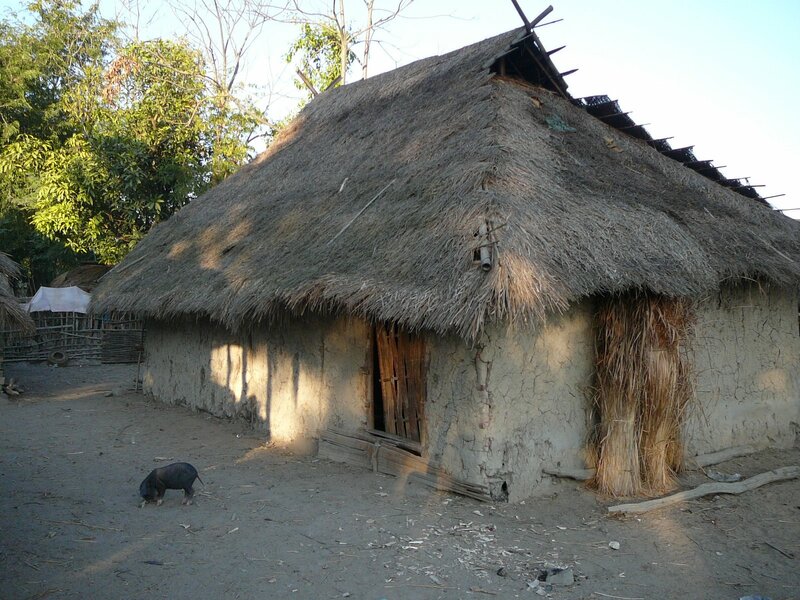 Firstly they are one of the few tribes that have huts made of mud. They make a bamboo frame and fill it with packed mud. 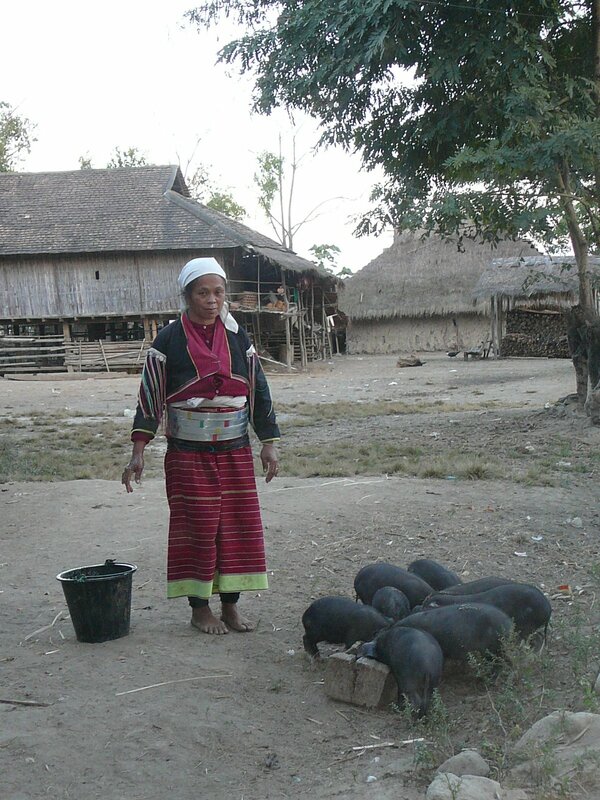 This is great insulation against the cold, but unfortunately the ox and pigs find the mud walls appealing and tend to rub their sides on them, causing the walls to become thinner and thinner until they collapse. The second point of interest is that all the women wear what looks like half a dozen small Hula Hoops around their waist made of silver and bamboo. They are completely inflexible and seem to be more of an annoyance than anything else. This particular village is also famous for its blacksmith, a man of 82 who is working when we get there, making shock absorbers for the local cars. Apparently shock absorbers and springs for the old Toyotas are impossible to get hold off, and this man has learned how to make them despite the fact that there is not one car in the village, and he has never learned to drive. 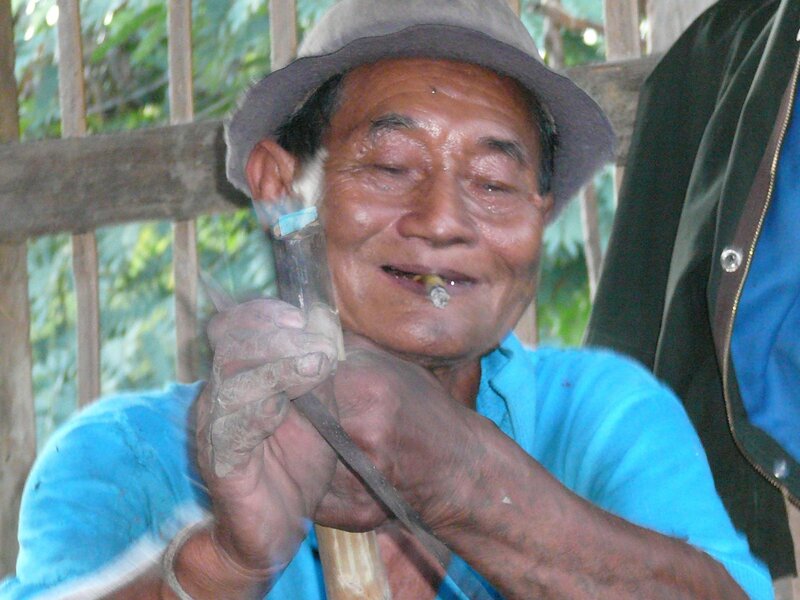 This entry was posted in Burma, local residents, Myanmar, Paloung Tribe, travelogue, village life, Wan Pao Village. Bookmark the permalink.